With soldiers still fighting in the Middle East after 17 years, the White House obsession with creating a “Space Force” may seem odd. But in a speech at the Pentagon today, vice president Mike Pence confirmed that the administration plans to do just that. It’s a decision that, however bizarrely timed, is being driven by a potent mix of national security concerns, space spectacle, and pork-barrel spending. Space is vital to U.S. national security and military power, even if very little of what you might consider “warfighting” goes on there now. America’s orbiting military computers are an incredible asset, providing communications and surveillance on a scale that its adversaries can’t rival (to say nothing of how important they are to the US economy). What’s protecting those orbital computers is mostly that they are tens of thousands of miles above the earth, orbiting at nearly two miles per second. But that’s not the comfort it used to be. Russia and China are demonstrating increasing abilities to get to space and take military action there, as a broader technological revolution makes it easier for small organizations of all kinds to disrupt space. On earth, jamming techniques used by countries like Iran are growing more sophisticated, while the maturing weapons program in North Korea requires new surveillance tools to protect Americans. A number of lawmakers, particularly Alabama representative Mike Rogers, have been pushing for the military to do more in space. In response, the Air Force, currently responsible for most space missions, revamped its command structures. But these lawmakers want a dedicated military branch focused on space, an organization that would also be well positioned to pour money into the coffers of defense contractors like Boeing, Lockheed Martin, and SpaceX. While the military, and particularly Air Force leaders, have resisted a more massive re-organization, the notion of a Space Force did capture the imagination of president Donald Trump. At a June event focused on shifting more space resources into civilian hands, Trump suddenly ordered the creation of a new, separate branch of the military. More recently, his supporters have started chanting “Space Force” at rallies. It’s not that simple. One key problem is that this expensive decision will require congressional approval, which is why on Thursday, Pence announced everything but the creation of an independent space force. There will be a new space command, led by an Air Force general; a new space operations force, made up of a select group of the thousands of U..S military personnel and contractors already working on space issues; and a space development agency to help with the military’s primary mission in space: buying expensive space hardware from private companies. Then, Pence says, the administration will push Congress to create an independent Department of the Space Force within the Pentagon by 2020. Whether lawmakers take the White House up on this remains to be seen, especially if partisan control of Congress changes hands in this fall’s election. Trump’s Space Force also rests on the premise, largely false, that the U.S. lacks military power in space. 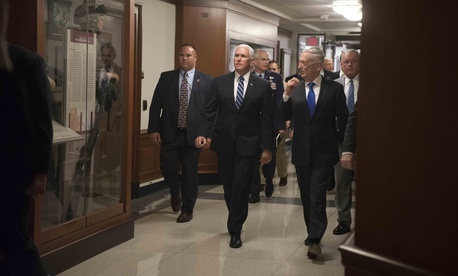 “Our adversaries have transformed space into a war-fighting domain already, and the United States will not shrink from this challenge,” Pence said today. In reality, the US military has demonstrated anti-satellite weapons since the 1960s and as recently as 2008. The U.S. Strategic Defense Initiative in the 1980s and early 1990s was probably the largest military space effort in history. What’s different now is that potential adversaries are catching up to US capabilities, leading Pentagon strategists to search for new advantages. It’s important to understand that the Space Force, at least at first, is an exercise in re-naming and re-organizing existing military space commands. NASA and its plans to fly astronauts next year are not part of the Space Force, and the Space Force will not be putting weapons in space yet because the U.S. doesn’t have any (publicly known) weapons that it could put there. But increasing fears about North Korean nuclear weapons and Chinese hypersonic missiles have defense officials like Michael Griffin, a former director of SDI and administrator of NASA, considering the merits of a new constellation of threat-detecting satellites in space. That’s also important to understand: When you imagine a generation of space warfighters, don’t think of a Space Shuttle with lasers. Instead, picture a control room full of talented engineers, driving sophisticated orbital computers to watch over their enemies.